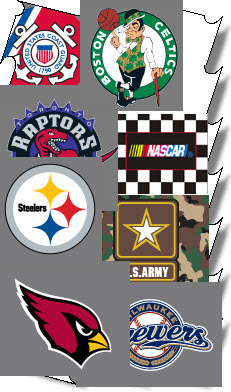 Get A Logo Floor Mat of Your Favorite Sports Team, Military Branch or Car Here ! Ok, I admit I spend weekends at a time watching old war movies and I’m a big supporter of the US Military. What better way to indicate my support than a Military Logo on my car floor mats? FanMats covers most branches of the US military; Air Force, Army, Navy, Marines, Seabees, Coast Guard and the Coast Guard Academy. So I'm Happy. Oh, you don’t like violent stuff, huh? Well, my nephew spends his weekends and most of his waking hours watching sports. Sound like you? Then you need a sports theme logo floor mat from FanMats for your ride. You can get FanMats to put logos from many Colleges, the NHL, MLB, NFL and NBA on your choice of floor mat types. FanMats also has a category of mats they call "House Divided". For example they have a mat which has both the Ohio State and University of Michigan logos on it. Or a Dallas Cowboys and Washington Redskins logo set. You think of the grudge match in football, bball or other sports at the pro or collegiate level and FanMats probably has a mat just for you. If sports and the military aren't your thing, just maybe you're a Ford Fanatic. There's a FanMats mat for you. Simply put FanMats has a totally awesome selection of sports, military and automobile logo car floor mats. They make the mats in Suwanee Georgia in a 138,000 sq ft state of the art manufacturing facility. The mats are constructed of heavy duty vinyl, a vinyl carpet combo or an 18 oz. thread weight carpet. Most of the vinyl and vinyl/carpet mats use multi-level channels to contain liquid spills, dirt and mud. The vinyl mats may be trimmed to improve the fit. The nylon carpet mats drink up the mud and liquid and wick it away from your tootsies. In either case they all have a non-slip backing and a skid resistant surface. These universal fit (one size fits all) front car mats are approximately 18" x 27", the rear mats measure 14" x 17" and the cargo mats come in at 31" x 31". The logos on the carpeted mats are printed using a chromo jet process which allows the ink to penetrate down the entire tuft of yarn. The result is a vibrant, colorful car mat you’ll be proud to display! I think (but I'm not sure) that the vinyl mats are made from plastisol and the logos are raised and almost 3-D in appearance and feel. I know you'll find a FanMats mat that you'll like , cherish and maybe even wash off with mild soap and water once in a while..
Keep your FanMats clean, dry and shiny with some universal absorbent car mat protectors. Also helps to reduce stains and mold/mildew smells in your vehicle and keeps your feet clean and dry. 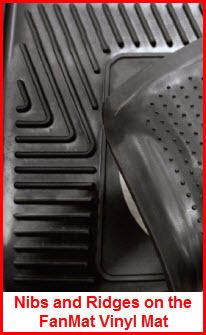 Remember, while a plastic/rubber mat may hold liquids and mud on top of the mat, you put your feet on top of the mat! Heaven forbid, if you can’t find a FanMats Logo Mat that ticks your tock, check out my Logo Floor Mats Buyers Guide . It has listings for the major car floor mat manufacturers who really know how to dress up their mats with all kinds of logos and custom embroidery. And if by some chance you don't find a logo that you like from FanMats you can give a shot to one of the other logo floor mat companies I talk about on my Universal Logo Mats page. Some Cool FanMats Licensed Logos You Can Get on their Car Floor Mats.